Saint Frances Cabrini Roman Catholic Parish is one of the largest parishes in Beaver County. Founded in 1960, it has had some serious continuity among the clergy leadership. 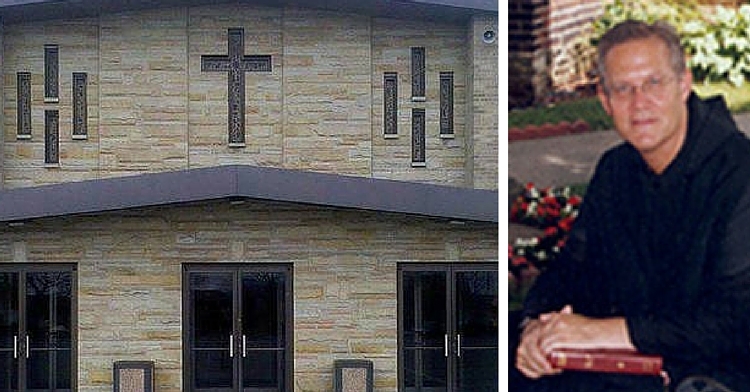 Father Joseph Kleppner, who retired two years ago, was only the third pastor its long history. Kleppner led the parish since 1996, and after his retirement, the congregation was blessed with another pastor, albeit with a very different background. Father Martin Bartel was installed as pastor of the thriving parish in 2015. Bartel is not your ordinary Catholic diocesan priest. That’s because he is a Benedictine monk. He also has more degrees and accomplishments than most corporate CEOs. His diverse background in the faith, as well as in academia, has led him to where he is today: serving his flock in Center Township. Bartel was the president of Saint Vincent College from 1995 to 2000, and served at the college in some capacity since 1989. He earned a Juris Doctorate from the University of Pennsylvania Law School in 1989, one of the most prestigious and elite law schools in the United States. Prior to that, he earned his MBA from Bowling Green State University in 1984. He also graduated from the Saint Vincent Seminary in 1984. Before arriving at the seminary, he earned a bachelor’s degree in business administration from Temple University in 1978 with a major in accounting and a minor computer science. Father Martin became a monk of Saint Vincent Archabbey on July 10, 1980, where he swore his simple profession of vows. On July 11, 1983, he swore his solemn profession of vows, and was ordained a priest on May 25, 1985. A certified public accountant in Pennsylvania since 1989, Father Martin also served from 1990 to 1995 as a member of the Westmoreland Bar Association’s Publications Committee and as case editor of the Westmoreland Law Journal. He is the author of several articles published in The Pennsylvania CPA Journal, Villanova Law Review, Legal Bulletin, Temple Law Review and The Duquesne Law Review. With all that being said, Father Martin is not a native to Beaver County. He came here almost two years ago to assist Father Kleppner, and eventually transitioned into his role as pastor. Recently, I was able to sit down with Father Martin for a Q & A. 1. What do you miss most about being at St. Vincent College? Well, I do miss the daily interaction with students, and I thoroughly enjoyed living with the students in the dorms. It was all of the fun of being a parent with none of the responsibilities! Primarily, though, I miss the camaraderie and fellowship of living with my brother monks. While there I benefited greatly from the prayerful and loving support of the community of roughly 125 priests and brothers. No day was the same, and certainly no day was boring. 2. What was your first impression of St. Frances Cabrini in Center? Probably its size, nearly 2,000 families. The largest parish I had previously served was only 800 families. Even when I had two parishes, I provided pastoral care to only a total of 1,100 families. That first Sunday seeing so many in the congregation was a little bit intimidating. Since then, the friendliness and appreciation has eased the initial apprehension. 3. Where do you like to eat out in Beaver County? O’Connell Hall at St. Frances Cabrini where Tootsie Narvett and the “Tootsettes” keep me well- nourished and even better entertained. When they are “closed,” I am still discovering, even after 2.5 years here, new good places to eat. I am amazed at the number of restaurants and the quality of food and service. And we have a lot of parishioners who certainly know their way around the kitchen! Plus, I like to dabble in the kitchen. I would never dare call what I do there “cooking”! 4. What do you like most about being pastor at St. Frances Cabrini? The opportunity to be inspired and nurtured by the faith and encouragement and support of so many prayerful, faith-filled people. The daily lived experience of many parishioners, many with burdens and challenges peculiarly their own, many with reasons for great rejoicing, is a wonder to witness, a privilege to share, and a strengthening of my own Christian commitment. I recall one Saturday where I celebrated a funeral, witnessed a marriage, and baptized a baby in a span of six hours. All three experiences were blessings and a “shot in the arm” to my own desire to respond to God’s grace to become more in the image and likeness of Christ. 5. What’s the biggest challenge of being a pastor? Finding the time and energy to be a real shepherd in the image of Christ while also tending to the administrative duties of leading an organization. For example, I am relieved when I can arrive at a reasonable, balanced budget, but then I wonder how many pastoral needs went unmet while I had buried myself in my worksheets and calculator! 6. In your opinion, why is the secular culture overtaking Christian values in our society? This may be too simplistic, but I see it as a case of ease. And we humans generally take the easier route. It is easier to “go along to get along” rather than rock the boat and ask the hard questions. It is easier to answer only to ourselves than to some greater power, God. It is easier to write the rules ourselves than to follow the designs of our Creator. It is easier to live only for the known present than to consider the unknown bigger picture. It is easier to act individually than to meet our responsibilities to others. 7. What challenges does the Catholic Church have to overcome in the next 10-20 years? I see it as one huge challenge: to reassert our relevance in today’s world. The Church continues to provide a resolution to life’s deepest questions and inmost yearnings, and offers meaningful assistance to those who seek to imitate Christ and enter into a deep relationship with Him. Sadly, many other alternatives seem to be more appealing, and even superficially more efficacious, but none is ultimately able provide what the Church offers. God bless Pope Francis who every day makes this known to the world. 8. As a priest, what is your favorite time of the year and why? Liturgically, Holy Week and Easter is the highlight of the year for me because we get to experience and re-live the last events of Jesus earthly life. Personally, I enjoy Christmas time because of the emphasis on family and getting to see and meet so many coming home for the holidays. 9. Why does Pope Francis appeal to so many people across so many different Christian faiths? He is “the real deal.” He talks the talk and walks the walk. He is genuine and sincere. He puts on no airs but proclaims the truth of Jesus Christ as he ably sees it, even when it ruffles a few feathers. And he speaks from the heart as one who has seen human suffering but also God’s summon to a better, higher life. May he live to be 500 with clarity of thought and agility of movement until a second before God calls him home! 10. What do you do for fun in your spare time? Walk and run and play catch with the new lady in my life: my six-year-old chocolate German shorthair pointer named Algebra. I rescued her last October, and she is a delight. However, we are having “issues” right now as she has become a little cocky since her “cugin'” CJ won Best of Show in the Westminster Kennel Club Dog Show recently. While we walk, we’ll be discussing the capital sin of pride.